A recurrence here is : how could I explain my GF or my wife( or simply my partner) that I am a man ,with no wish being a CD or whoever with similar tastes? Often the question is: should I show this site to my partner. And the answer is NO! Why? Because on the site we have so many different styles.Some with only female clothes,some with a mix,some painted toes nails. and more. That's ok for us. But not for a woman we want to show that we are not unique and a real man. Can't we find a possibility to have a separate forum,with no possibility to have access to the whole site that we could show to a woman who is wondering about if her man is still a normal man or moving to the side she can't accept. Please consider my proposal only as a help to the issues so many guys here are facing. @Tech what do you think ? If it is an acceptable option,we will need someone who ( moderator?) is able to decide what is " man" and what isn't! There is such a forum but it is absolutely dead as far as activity goes, with only two regular posters but even they might post something only about once a month, if that. Some of the sections have not had a post in well over a year. I know exactly what you mean about HHP and, shall we say, the great diversity of styles here. Men who simply want to wear heels, as a footwear fashion choice - and nothing else - seem to be much in the minority. This would certainly not be a site one would show a wife or girlfriend to convince her that you had no interest in crissdressing or anything else. It would set alarm bells ringing rather than quieting them. I think the guidelines are pretty clear here that this is a fashion website, not cross dressing, and the content here fairly appropriate reflects that. Yes, there is a bit of diversity, but isn’t that healthy when it comes to fashion? The problem with most shallow people outside of HHP is that they have an incorrect definition of cross dressing. They think that if you put on a pair of heels, you are cross dressing. So even if you had a website where men are just wearing heels with suits, the website would not convince them of anything, but rather they would still think of it as a cross dressing website. The issue is not the content of the website, but that most people have a shallow and narrow minded concept of fashion. I admit that when I first found HHP, it shocked me a little as I had never put that much thought into fashion. But I read the guidelines, lurked a little, started to understand, and found that this is generally a polite community of like minded people, which is hard to find on the internet anymore. Showing someone HHP is not going to magically redefine cross dressing for someone overnight. But if they are ready to open their minds to talk about fashion beyond the mainstream, it is a very supportive resource. I agree wholeheartedly - merely donning a pair of heels is in no way crossdressing by any reasonable or logical interpretation. And, frankly, I doubt that a website that confined itself strictly to men, dressed entirely in masculine fashion except for heels, would be considered a crossdressing website by very many people. Odd perhaps, but not crossdressing. The term Crossdressing generally conjures an image of men-in-frocks - not a man in a business suit who happens to be wearing ankle boots or pumps. A lot of the stuff that goes on at HHP however goes way beyond just putting on a pair of heels - skirts, dresses, make up, hosiery, corsets etc - stuff that the overwhelming majority of people would see as crossdressing. And no matter what your definition of crossdressing might ultimately be, showing this site to ones girlfriend or wife would not be a useful way to reassure her that your wearing a pair of heels is not the thin edge of the wedge and that further revelations will not be forthcoming. I had never realized that heels4men had this purpose. It doesn’t have a list of guidelines like HHP and the content is so sparse that it is a little harder to derive the overall theme, so I never joined. Maybe it is time I signed up and started posting pictures of the heels I wear into the office? HHplace being about integrating fashion and high heels, I find normal that man tries every possible items, regardless of gender. This is a trial and error approach, with some looks improved little by little, with great advice from friendly, sometimes anonymous, open minded people. I don't see hhplace content as a showcase, but rather as a mirror. Or the eye of a shopping pal. A good laugh is possible. Yes, the content I enjoy the most at HHP are fashions that people wear out and about on a daily basis, and that might include the other items that go with the heels. I think focusing on practical fashions that we would actually wear out of the house will help distance us from obvious cross dressing or fetish activity. There are skirts, dresses, and bright makeup out there that are so edgy that you don't even see women wearing them on a day to day basis. It should not surprise us, then, that if men were to wear these things, people are going to call it cross dressing, at minimum. On the other hand, there are many nice skirts, pants, shorts, etc. that can even be office appropriate and no one has ever accused me of cross dressing when wearing them. 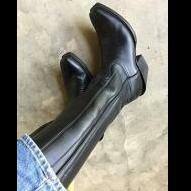 What people have forgotten and need to relearn is that it was the MEN that wore the heels,riding boots,and thigh high boots FIRST....the women then took up these articles of clothing when it became impractical for men to wear them anymore. Also remember that before pants were invented that everybody wore skirts,kilts, and tunics (dresses) that were at least knee length and sometimes longer. I don't see the wearing of any of these articles of clothing as cross dressing but as taking back what once belonged to the men in the first place. However,times and fashions have changed and in today's world anytime a man dresses in something besides a suit,jeans,and shirt unfortunately will be tagged as strange,abnormal or a crossdresser. People once wore ruffs and powdered wigs too, but what went on centuries or millennia ago has no real relevance to today. Sure, The idea that tunics were once worn by men many centuries ago is not going to be a convincing argument that wearing dresses and skirts isn’t cross dressing. Your input would be welcome on H4M! Especially given your literacy, activity and common-sense, as demonstrated here - I mean that sincerely. we need someone,not me because of my poor English,for writing some guidelines. And a " moderator" or a " man style with heels fashion gourou" who is able to delete any deviant style. It would be nice if such a thing could get off the ground. Every. Now and then there is a flurry of activity on that site, most recently in January, but then it dies as swiftly as it starts. Thank you. But not enough for editing such guidelines. We need slightly more guys here who are interested in writing posts on that subject. Just wondering: if HH4 men is not receiving enough visits,why not a special forum here? Because it would be pretty soon inundated with guys wearing skirts, dresses, and make-up - and if you suggested that wasn't in keeping with the idea of the forum they would argue that since ancient Romans wore tunics two thousand years ago, which in their view was not unlike a skirt, that skirts should still be considered legitimate male fashions. I am totally with you about a site that caters for men in heels nothing else, I am a guy that enjoys heels but not interested in any thing else female in any way, I did state that in heels4men about a few years ago, but there we go. I think the main guy in that site had the hump about Feb and he said he would resume again in March and I keep looking but nothing has happened, so maybe the site needs a few people like myself to post again and get it going as I said before I am not interested in dresses nail polish etc, just a guy in heels. The only postings on H4M since the end of Jan have been one from me (to which no responses) and yours today along the same lines as above. Not encouraging! But topics on H4M have ranged beyond just 'men in heels' without really straying into the other areas you mention, which is no bad thing. So,to avoid men in skirt or whatever is NOWDAYS women fashion we need a fashion gourou who is allowed to decide . But this forum would be a forum only for guys in masculine heels. Anyone could post if the rule is respected: men attires plus heels! Men in skirts could have their own forum. What they probably don't need. They have already overcome our problems. I wouldn’t put it that way. I have utterly no interest in wearing skirts or any of that stuff and I don’t see that as a problem to be overcome. I am afraid I am wrong! The idea was to help some members who have difficulties in being accepted as " normal" men. What is normal? Who is a real man? The smelling bad,dusty,rough cow boy? Or the very polished lawyer in Armani from NYC? Even if I personally don't wish to paint my toe nails or wear a skirt,where do the feminine artifice starts to be inappropriate for a man ? Make up,ear rings,flashy colors,skinny jeans..... no limit in that list. So the only things we can do is posting about what we like and hope the community could grow. Actually I would argue that there could be less acceptance for men in skirts than men in heels. There are also some interesting similarities and synergies between the two topics. There is a forum for men wearing skirts - www.skirtcafe.org. I’m not a skirt wearer, but stumbled across that one looking for something else. This discussion seems to be going to the heart of what a 'heels for men' forum should be, and rightly so. DWW (above) is suggesting that there should be a forum which has content relating solely to men wearing heels in otherwise male mode (dress, appearance and activity). Fair enough, but I very much doubt that such a narrow topic will, by itself, sustain such a forum. I am certainly not advocating a forum which supports significant adoption of conventionally feminine clothing, make-up etc by men (let alone cross-dressing, as usually understood), but where is the line to be drawn? Many potential male heel-wearing members will also venture sometimes a little more widely into the realms of femininity, perhaps wearing (discreetly) women's footwear without high heels, women's jeans and blouses, leggings, stockings etc - some of which at least are arguably unisex or freestyle - whilst remaining firmly in male mode. Skirts and full make-up are another matter - as has been said, forums for that exist elsewhere. There is also the question of covering 'blokeish' topics that have little or nothing to do with men wearing heels, such as motoring, DIY, sport etc. Why not, if it keeps some friendly exchanges going? But I would question the inclusion of topics primarily relating to women and women's fashion, except where they are illustrating shoes etc that are of appeal and interest to men if worn by men. In other words, no wholesale posting of pics of so-called celebrities simply because the poster likes them, or their clothing or activity - the forum should not be a fan club. In my opinion, H4M has the right framework - BUT it needs more support and (if that doesn't conflict) more concentration on men in heels and male activity. I note that, in almost 10 years of membership, DWW has contributed a mere 33 posts to H4M. No disrespect intended, but I'm sure that he could have done more there to foster the interest he has. How about it? I agree there is less acceptance for men in skirts than men in heels. As for synergies, I wouldn't say so - there is no more connection between men wearing heels and wanting to wear skirts, than there is between wearing heels and being gay. I have absolutely no interest at all in wearing skirts or anything along that line. I like tall boots, with or without heels, simply for fashions sake. That is the total extent of my interest. In other words, no wholesale posting of pics of so-called celebrities simply because the poster likes them, or their clothing or activity - the forum should not be a fan club. And yet that is what goes on a lot at H4M - as I recall there is one particular thread consisting mainly of that and almost nothing else.